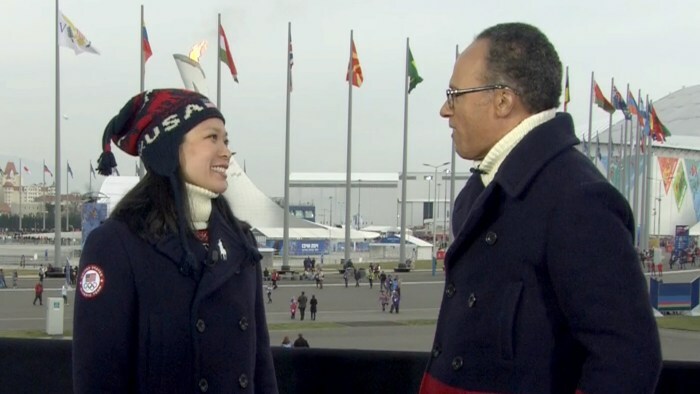 Julie Chu complimented Lester Holt, who was also wearing the official Closing Ceremony outfit. "You look great in it," she told him. Four-time Olympian Julie Chu was chosen by her fellow athletes to represent Team USA as the flag bearer at the Closing Ceremony, which she said was a great honor. "I'm so humbled," Chu said. "I don't even know how to express it." She told TODAY's Lester Holt that she could barely speak when she heard the news. "And I'm not usually at a loss for words," she said. The ice hockey champion was part of the silver-medal-winning team in Sochi and will enter the stadium wearing the official Closing Ceremony outfit, with the American flag held high. "It won't be on a hockey stick, will it?" Holt asked. "I'm trying to finagle a hockey stick," Chu joked. "I don't know if they'll let me." She said that she is proud of the "tremendous" effort by Team USA at Sochi and that she has "loved every moment."